No greater bicycle-per-capita rate than in Holland. 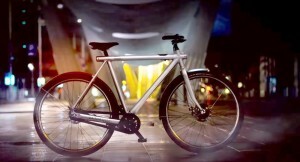 The Electrified S from Dutch bike manufacturer vanMoof, is claimed to revolutionize a category so often known for its noisy engines, heavy frames and bad design. Electric-assist bikes, when designed right, can be a game-changer for getting more people out of cars and onto bikes, in cities that come with big hills, hot climates, and longer commuting distances.